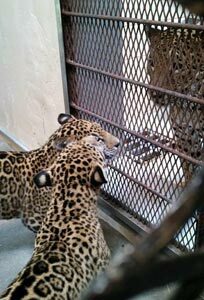 What’s New With Our Jaguar Cubs? Our 8-month-old male cubs are growing fast and are almost as big as their 84-pound mom, Stella! Zean weighs in at 83 pounds, while B’alam trails slightly at 81 pounds. Their weights are not the only thing different about these two brothers, as their individual personalities are really starting to show. B’alam’s personality is similar to his father Pat’s easy-going personality, while Zean’s personality is more similar to his mom Stella’s, energetic personality. B’alam moves a lot slower and is always the last one to get up in the morning, while Zean likes to be the center of attention and investigate everything. They do, however, have many things in common. Both cubs love playing, eating, and interacting with their dad, Pat. The cubs have many favorite “toys” and enrichment items. One of their favorite things to do is to play in a bubble bath keepers set up in the cub’s inside pool! Keepers have assembled an Amazon Enrichment Wish List of needed items the public can purchase and have sent directly to the Zoo. 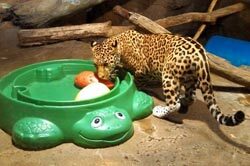 Enrichment items help keep our animals’ minds active and they also help the animals display natural behaviors, just like they would in their wild habitats. The cubs still try to nurse from mom, Stella, but keepers believe she stopped producing milk a few months ago. Not to worry though, each cub is fed three pounds of Nebraska premium beef each day, not to mention chicken patties, herring, squid, hard boiled eggs, dog kibble, and pork chunks. The cubs love interacting with dad, Pat, through a mesh divider. They spend long periods of time just staring at their dad – they seem to be in awe of him. He does respond to their attempts to play by face rubbing with them. The cubs rotate on outdoor exhibit with their dad Pat, so if you see Pat outside that means the cubs are in their indoor exhibit. The cubs tend to sleep more when on inside exhibit and play more when on outdoor exhibit. Visit the cubs daily, at the Florence Mila Borchert Big Cat Country, and please check out our Amazon Wish List.